Players face several perils throughout the game of chula. 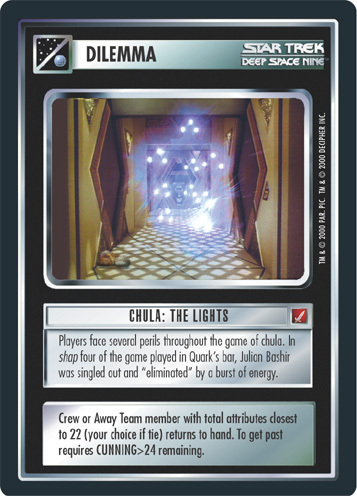 In shap four of the game played in Quark's Bar, Julian Bashir was singled out and "eliminated" by a burst of energy. Crew or Away Team member with total attributes closest to 22 (your choice if tie) returns to hand. To get past requires CUNNING>24 remaining.